Jamie Mitchell celebrated after finishing first for the fifth straight year in the 10th annual Quiksilveredition Molokai-to-Oahu Paddleboard Race. The count is now at five for Jamie Mitchell. 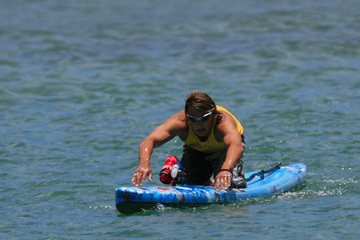 A record five straight wins in the Quiksilveredition Molokai-to-Oahu Paddleboard Race. And, five years of undefeated paddleboard racing overall. The Australian star won the 10th annual Quiksilveredition yesterday, his fifth consecutive win in the race across the Kaiwi Channel considered the world championship of the sport. Still without a loss in any paddleboard competition in the world during his five-year run, the 29-year-old from Queensland completed the 32-mile course in 5 hours, 19 minutes and 26 seconds. Current World Ironman champion and first-time Quiksilveredition participant Zane Holmes, also from Queensland, finished second, more than 17 minutes behind at 5:36:38. "It's awesome, even though there was a lot of pressure this year," Mitchell said. "You wake up feeling 90 percent, and it mightn't be your day. But I felt really good today, and I'm just glad it all worked out. "You've got the best watermen in the world out there, and you ask any one of them -- it's tough out there. But that's why (the Quiksilveredition is) so prestigious." A record 83 total entries and 130 paddlers overall (some competed as two-person teams, alternating on board) began the race at 7:30 a.m. at Papohaku Roadstead on Molokai. The finish was at Maunalua Bay on Oahu. Paddleboards are essentially streamlined surfboards (16-foot average length) that are designed to ride open-ocean swells, which athletes arm-paddle on their knees, prone or both. Jamie Mitchell received a hug from 7-year-old Isabella Walker after winning yesterday's race. Conditions were tough in the channel, with relatively small swells coming from various directions and a receding tide pushing paddlers away from their destination. Mitchell finished about 24 minutes off the race record (4:56:03) he established in winning the Quiksilveredition two years ago. Still, Mitchell said he was in the best shape he's ever been in during his winning streak, and that he performed to his fullest potential yesterday. As proof, Mitchell's winning margin was nearly three times the almost-6-minute victory he enjoyed when he took the title in 2002 -- previously his largest in the race. The scary thing for Mitchell's competitors is that he only seems to have gotten better as others unsuccessfully try to take him down. "I think today, out of every crossing I did, I just did everything perfect," Mitchell said. "I had a good line, took all my (nutritional supplements) at the right time -- it's just really good when you know you've done everything right. (And) I'll keep coming back as long as I enjoy it." Mitchell and Holmes separated themselves from the pack early in the race, and battled back and forth until about its midpoint. That's when Mitchell scored a couple of successful rides on the open-ocean waves and put about 100 yards between himself and Holmes. Jamie Mitchell closed in on the finish line, which he crossed more than 17 minutes ahead of the second-place finisher. "You really had to choose your bumps (waves)," Mitchell said. "The ones you could get, you had to put all of your effort into. And the ones you didn't think you could get, you just had to let them go because you don't want to go hard for a bump and not get it." Despite being a world-class all-around athlete, Holmes could not make up significant distance on Mitchell, and the champ continued to build on his lead from that point. In contrast to Mitchell, who was quick with words immediately afterward, Holmes was visibly spent. "I started to feel the current at about the halfway mark, and that's when things started to go bad for me," Holmes, 25, said. "I just didn't have it in me. (With) the enormity of the distance of it, I can't really remember the last half. I was on another planet. It was the toughest thing I've ever done." California's Gary Fortune finished third in the open division at 6:00:28. The North Shore's Matt Barnett was the top Hawaii finisher in the division at 6:26:44 and 13th overall. California's Eric Meech, who won the stockboard (board must measure 12 feet long) division last year and was expected to be a top contender after moving up to the open class, suffered a broken rudder to his open board early in the race and was allowed to switch to a stock replacement with a 1-minute penalty. Though he was the first to cross on a stockboard, with the penalty added on, Meech (6:28:26) placed second to Keoni Watson (6:28:03) of Honolulu. Four-time women's champion Kanesa Duncan of Hawaii was the only female solo competitor this year, and with an open board picked up her fifth Quiksilveredition win at 6:33:54. Among other division winners, Maui's John Gangini and Kiva Rivers (5:46:34) took the men's team title.